Good afternoon! It’s a pleasure for me to be here at Northern Trust, an important company in America’s financial field. I am also glad to know that your corporation is expanding operations in China. As we all know, the 19th National Congress of the Communist Party of China was held in Beijing last month, exerting great significance for both China and the world. Today I would like to touch upon this Congress and the new opportunities brought by China’s development. The 19th CPC National Congress makes an important judgment that the socialism with Chinese characteristics has entered a new era and the principal contradiction facing Chinese society is that between unbalanced and inadequate development and the people's ever-growing needs for a better life. The Congress also highlights the Xi Jinping Thought on Socialism with Chinese Characteristics for a New Era, and proposed strategies for maintaining and developing Socialism with Chinese Characteristics in the new era. Moreover, the Congress elects China’s new leadership with General Secretary Xi Jinping at its core. The Congress focuses on people's yearning for a better life, and outlines an action plan and a blueprint for the development of Socialism with Chinese Characteristics in the new era. By 2035, China will basically realize socialist modernization based on the building of a moderately prosperous society in 2020. By that time, China’s economic and technological strength will have improved significantly. People’s right of development will be adequately protected. The rule-of-law and the modernization of China’s system and capacity for governance will be basically achieved. Social etiquette and civility will be significantly enhanced. People will lead more comfortable lives, and the size of the middle-income group will grow considerably. Solid progress will be made toward prosperity for everyone. There will be fundamental improvement in the environment, and the goal of building a Beautiful China will be basically attained. By 2050, we will build China into a great modern socialist country that is prosperous, strong, democratic, culturally advanced, harmonious and beautiful. By then, China’s material, political, cultural and ethical, social and ecological strength will be comprehensively improved, and China will become a global leader in terms of composite national strength and international influence. The goal of common prosperity for all will be basically realized, and Chinese people will enjoy happier, safer, and healthier lives. Development is the underpinning and the key for solving all China’s problems. To achieve those great aspirations, China will comprehensively deepen reform, innovate its model of development, and unleash the dynamism for development. I believe China’s development has four features. The first is its scientific nature. Scientific development highlights new vision of development featuring innovation and coordination. Innovation is the primary driving force behind development. As China is still catching up with other countries in terms of scientific and technological development, China will promote innovation in theories, institutions, science and culture, and speed up the effort to build itself into a country of innovation. China will encourage more social entities to make innovations and start businesses, build an innovative workforce, and create new drivers for economic growth in an innovative way. Unbalanced and inadequate development is another prominent challenge facing China, featuring contradictions in development between regions, rural and urban areas, different industries, and economic and social development. To address these contradictions, China is pursuing the rural vitalization strategy and coordinated regional development strategy which enable different regions to prosper with their own advantages and allow new industrialization, IT application, urbanization, and agricultural modernization to advance hand in hand. Second, openness. 2018 will mark the 40th anniversary of China's reform and opening up. For nearly four decades, China has opened its arms to the world and grown by leaps and bounds in this process. China is committed to the fundamental policy of opening-up. Looking ahead, China will open wider and never close its door. China will pursue the Belt and Road Initiative as a priority, increasing openness and cooperation. With these efforts, we hope to make new ground in opening China further through links running eastward and westward, across land and over sea. Furthermore, China supports multilateral trading regimes, facilitates building of free trade areas, and advocates an open global economy that would add new momentum to common economic development. Third, sustainability. China faces increasing resource constraints, severe environmental pollution, degraded ecosystem and acute contradiction between development and the population, resources and environment as it further develops. To address these pressing challenges, China stays committed to green development, steps up efforts to protect the ecological system, and reforms the environmental surveillance framework. Following the basic strategies of resource conservation and environmental protection, China treats the eco-environment with uttermost care and implements the strictest possible policies to build a beautiful China. As President Xi repeatedly stressed, clear water and green mountains are priceless assets, and that building an ecological civilization is vital to sustain the Chinese nation’s development. China plays an active part in global environmental governance, fulfills its emission reduction promise, and contributes to the global ecological security. Fourth, peace. Peaceful development is embedded in the genes of the Chinese culture. Since the modern time, the Chinese people have suffered gravely from the invasion of foreign powers and civil wars, making them cherish peace more than anyone else. China’s development does not pose threat to any other nation. China will never seek hegemony nor engage in expansion regardless of its development level. China will never compromise its legitimate rights and interests. Meanwhile, China will never pursue development at the expense of others. China remains firm in pursuing a path of peaceful development and an independent foreign policy of peace, advocating settling disputes through dialogue and resolving differences through discussion. We hope to build a community of shared future for mankind and an open, inclusive, clean and beautiful world that enjoys lasting peace, universal security, and common prosperity, as well as a new model of international relations featuring mutual respect, equity and justice, and win-win cooperation. China’s development will bring bigger opportunities to America’s business. First, stable political environment. The Chinese people highly respect President Xi Jinping who is the designer and leader of China’s modernization in the new era. Other Chinese leaders are both capable and vigorous. As the ruling party, the Communist Party of China will continue to strengthen its advanced nature and purity, resolutely fight corruption and handle political affairs with integrity. The strategic goals and measures introduced by the 19th CPC National Congress have strong support from the people as they are good both for the country and the people. China’s domestic and foreign policies will maintain its continuity and stability. As China’s economy keeps developing and social cause keeps improving, people’s lives will be increasingly better and the Chinese society will enjoy long-term harmony and stability. Second, greater business opportunities. With China’s contribution to the world economy exceeding 30%, it has become a major driving force for world economy. In 2016, trade volume of goods between China and the US reached 524.3 billion US dollars, 209 times more than that 37 years ago. China has become the largest export market of the US outside North America and one of the fastest-growing export markets of the US. Last year, US-China service trade reached 118.13 billion US dollars and the US service surplus to China was 55.7 billion dollars. The US service trade with China has grown by 350% in the last 10 years. In comparison, its service trade with other countries grew only by 100%. As China fastens its pace in innovation and improves its development quality, a radiation effect that is more comprehensive and stronger will come into being, creating more cooperation opportunities. As estimated, China’s GDP will reach 43.6 trillion US dollars and the per capita GDP 30,000 US dollars by 2035. By then, China will be among the moderately developed countries, which is not only of epochal significance to the Chinese people, but also will turn China into an enormous market with huge consuming power. In the next 15 years, China’s market will be further expanded and comprehensive. It is estimated that China will import 24 trillion dollars worth of goods, attract foreign direct investments of 2 trillion dollars, and make outbound investments of 2 trillion dollars. China is more than willing to import more fuel and agricultural products from the US, deepen service trade cooperation and welcome American companies and financial institutes to participate in projects of the Belt and Road Initiative. Third, improved policy environment. China will adopt policies to promote high-standard liberalization and facilitation of trade and investment, implement the system of pre-establishment national treatment plus negative list, significantly widen market access, further open up the service sector, and protect the legitimate rights and interests of foreign investors. All companies that are registered in China will be treated equally and fairly. As outlined by the 19th CPC National Congress, China will make new grounds in comprehensively opening up. All foreign companies including American companies will enjoy a more open, transparent and standard operation environment in China. Recently, China has announced to significantly lift limits on the investment proportion of foreign companies in Chinese financial industry, widen market access for banking, securities and bonds, and insurance, and gradually lower tax on imported cars. In November next year, China will hold the first international import expo in Shanghai, which will serve as a platform for all interested parties to further explore the Chinese market. The US companies are all welcome to this expo. In the past year since the new US administration took office, China-US relations have witnessed smooth transition and achieved new progress with the concerted efforts of both sides. We have established four high-level dialogue mechanisms on diplomacy and security, comprehensive economy, law enforcement and cyber security, as well as social and people-to-people exchanges, which have helped step up mutual trust, incubate cooperation and control differences. The two sides implemented the 100 Day Action Plan, leading China-US relations to achieve dynamically balanced and mutually beneficial development. President Trump recently made a historic visit to China. President Xi Jinping and President Trump exchanged in-depth views on China-US relations and important international and regional issues of common interest, reaching much consensus on bilateral relations in the new era, achieving fruitful results, pointing out the direction and drawing a blueprint for the future development of China-US relations. The two leaders agreed that the development of China and the US are complementary while creating no conflicting interests. The successes of China and the US are in their common interests. In face of the complicated and volatile international landscape, China and the US are having increasing common interests, shouldering greater responsibility and enjoying more cooperation potential in safeguarding world peace and stability and promoting global development and prosperity. During President Trump’s visit, the two sides signed 34 cooperation agreements and intentions with a total value of 253.5 billion US dollars, covering fields in both trade and investment, goods and service, and products and technologies. This demonstrates the win-win nature of China-US economic and trade relations. The two leaders agreed to give further play to the leading role of head-of-state diplomacy, enhance exchanges at high and various levels, expand all-round cooperation based on mutual benefits, manage differences based on mutual respect, strengthen mutual understanding and friendship between the two peoples, and seek cooperation in tackling vital regional and international issues and global challenges. Sub-national cooperation is the underpinning of China-US relations. Cooperation between China and the nine states covered by the Chicago Consulate General in Chicago has become a consensus of all. The nine states have all shown strong willingness in growing ties with China and seen China’s development as an important opportunity. Governor Bruce Rauner of Illinois, Governor Rick Snyder of Michigan, Governor Kim Reynolds of Iowa and Governor Eric Greitens of Missouri all made visits to China this year. Cooperation in economy and trade keeps deepening. Last year, the trade volume between China and the nine states surpassed 90 billion US dollars. Boeing, Caterpillar, GM, and Ford among other transnational American corporations located in the nine states all made great strides in their operations in China. In the past 16 years, the accumulated investments from China to the nine states have reached 20 billion US dollars and created 45,000 jobs, in which Wanxiang Group alone sustained 18,000. Many large projects have broken ground. CRRC started building its railway vehicle assembly plant in Chicago. People-to-people exchanges have become increasingly frequent. The two sides have set up 15 pairs of sister states-provinces and 40 pairs of sister cities. Chinese students studying in the nine states have exceeded 80,000 and over 19 Confucius Institutes have been established. The Spring Festival celebrations featuring Chinese culture exhibitions have been held for four years in a row in Chicago, and have become a spotlight in Chicago citizens’ cultural life. It is fair to say that the cooperation between China and the Midwest is boasting a bright and broad future. As President Xi Jinping said, cooperation is the only right choice for China and the US, and a better future will only be achieved through win-win cooperation. The business community has long been committed to China-US friendship, connecting the two countries and promoting bilateral economic and trade cooperation. As the largest professional trust corporation in the US, Northern Trust set up its Beijing office in as early as 2005 and established its Beijing branch in 2010. 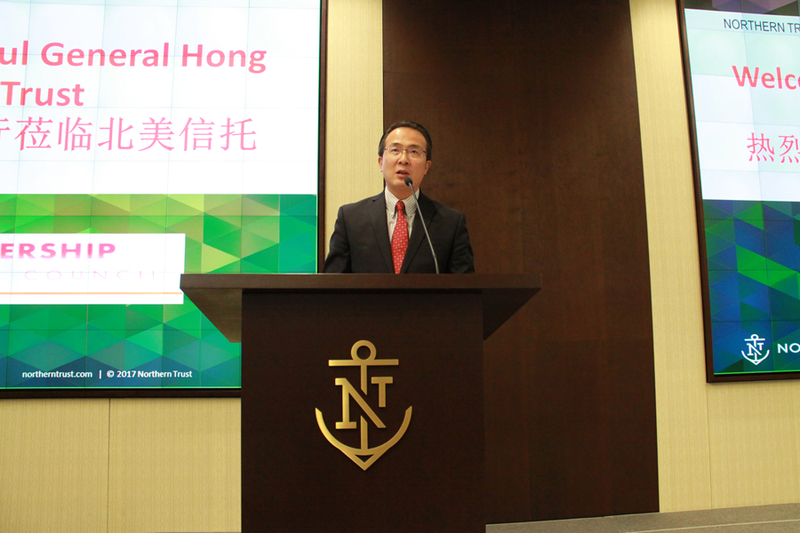 I hope that Northern Trust can continue to seize the opportunities brought by China’s development and China-US relations, and use your expertise to achieve even greater success. At the meantime, we hope that you can continue with your support to the stable and sound development of China-US relations, and deliver more benefits to the two peoples.